Article Health and Fitness > achieving general health > What is a healthy diet? A healthy diet is a well-balanced diet. In order to feel well and strive towards our full physical potential and well-being, we need to always consider what we ingest. What do we need, anyway, in order to function well? We also need fats, occasionally, for energy and for protection and safety of the body. Any weight-loss diet should include all of these, if the diet wants to be a long-term, healthy commitment rather than a sharp, short-term weight-loss method. Keeping the balance right is very important. There are many diets and each different diet has slightly different ratios between the foods. One diet worth considering (and eventually tweaking) is the Mediterranean diet. 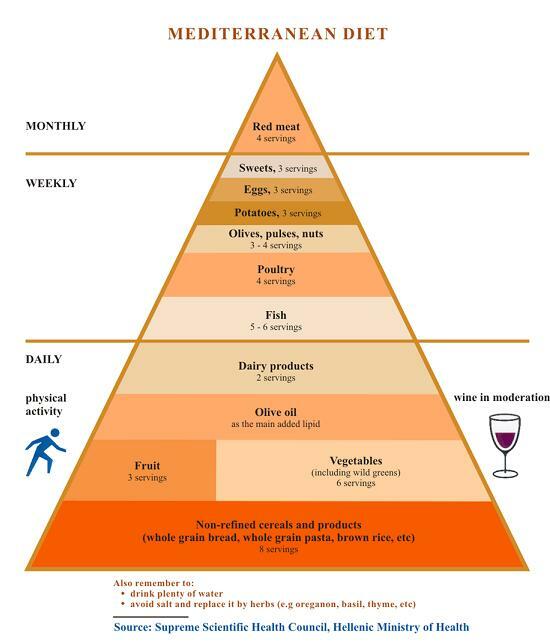 The pyramid shows the ratios that this diet suggests. Feel free to read more information on the Mediterranean diet if you are interested or you want to try it out. The Mediterranean diet is a great strong base for a healthy diet: however, it is important to keep in mind two main things. That carbohydrates can and should be reduced if you want to lose weight and your exercise is low to moderate. Having considered these two elements then, it is recommended to change the ratio of carbs and veggies to 1:1. Otherwise, veggies might also be the primary component of the diet and carbs could be cut down a bit. To finish off with carbs: it is important to consider which type of carbs you are consuming. In fact, grains and wholemeal bread is much healthier than white bread and if you are thinking of losing weight safely, you might want to consider these as alternatives to your normal loaf of white bread (either permanently or temporarily). Do not forget to write down what you eat, especially when beginning a new diet: you might think you are having crisps rarely but maybe you are actually consuming a packet every other day. Crisps are a particularly easy food to pack and have without being fully conscious. Try to substitute them with carrots, or any other veggies. You might struggle at first, but in a few days you might notice the difference already. Finally, remember: it is important to keep in mind that change does not happen overnight. If you keep on changing a small thing regarding your diet every week, you will gradually get in the habit of eating healthily. Balance is everything: if you have a bigger meal than normal one day, don’t despair and try to make up for it by cutting down the next day. Oh, and most importantly: don’t forget to drink water. Drinking loads is essential to keep your metabolism going!